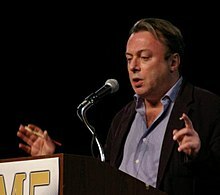 Christopher Hitchens (13 a viz Ebrel 1949 e Portsmouth, Rouantelezh Unanet - 15 a viz Kerzu 2011 e Houston, Texas) a oa ur skrivagner hag ur c'hazetenner breizhveuriat a oa o chom e Washington er Stadoù-Unanet. Tapet en deus diplomoù war ar brederouriezh, ar skiantoù politikel hag ar skiantoù ekonomikel e Balliol College Oxford. Un dizouead eo ivez. D'ar 15 a viz Kerzu 2011 e oa marvet Hitchens e Houston er Stadoù-Unanet. E-pad 20 vloaz e skrivas er sizhunieg amerikan The Nation, ma savas a-enep gouarnamant Reagan ha hini George H. W. Bush, hag ivez a-enep Brezel ar Pleg-mor (1990-1991). E 2003 e roas e zilez peogwir ne oa ket a-du gant dibaboù pennoù ar gelaouenn. Goude an 11 a viz Gwengolo 2001 e savas a-du gant ar brezel en Afghanistan hag en Irak. En e levrioù e tag meur a zen evel Henry Kissinger pe Mamm Tereza. E miz Gouere 2008 ec'h asantas bezañ jahinet gant dour a-benn sevel ur pennad diwar-benn an doare-se da jahinañ er magazin Vanity Fair. 1999 No One Left to Lie To: The Triangulations of William Jefferson Clinton. Verso. Adembannet gant an titl No One Left to Lie To: The Values of the Worst Family e 2000. 1988 Prepared for the Worst: Selected Essays and Minority Reports. Hill and Wang (SUA)/Chatto and Windus (RU). ↑ « Believe Me, It’s Torture », Vanity Fair, miz Eost 2008. Kemmoù diwezhañ degaset d'ar bajenn-mañ d'an 16 Ebr 2015, da 15:07.